I took Anupamji's picture during his visit to Connecticut for performing "Mera Woh Matlab Nahi Tha"
Presented by Terribly Tiny Talkies, stand out starring by ever amazing Anupam Kher, Natasha Rastogi and child actors Stuti Dixit and Abhimanyu Chawla, directed by Surya Balakrishnan and written by Sharanya Rajagopal and Surya Balakrishnan. A story took place when grandkids came home to visit their grandfather, where the grandfather, played by Anupam Kher is in a tricky situation of introducing his lady friend to his grandkids. It was a great cinematic experience of 6 minutes 44 seconds. It is like Indian Kheer full of sweet flavor and twist of spice (cardamom). Like making kheer, one has to be picky incorporating all the ingredients, dry fruits to hint of cardamom. It was exactly same experience with Short film kheer, a wisely depicted middle-class life with every single detail including a not working wall clock, to a worn out sofa instead of modern-day interior. It is worth stirring, I mean worth making for the audience with a beautiful twist. 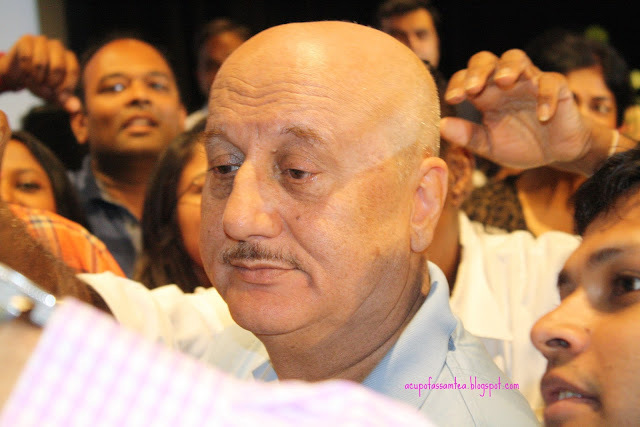 Veteran actor Anupam Kher as always had his best foot forward. Natasha Rastogi was great too, so were grandson played by Abhimanyu Chawla and granddaughter Stuti Dixit. Kheer always leaves a smile and Anupam Kher's debut short film Kheer did the same, a happy, hearty content smile. A sweet treat for valentines day.